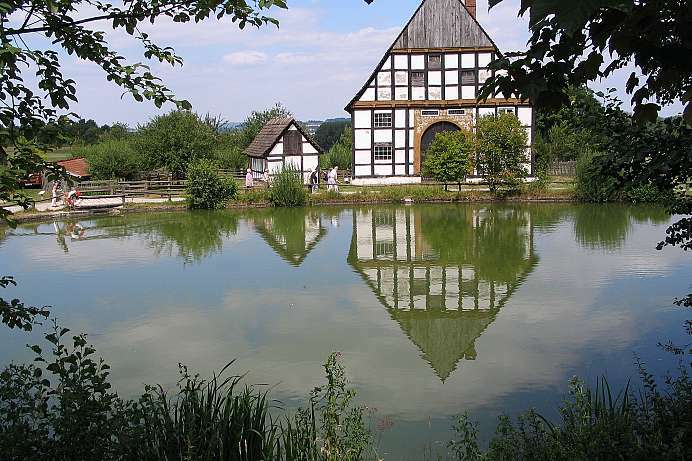 The town on the northern slopes of the Teutoburg Forest has a nice center with magnificent Tudor-style houses dating back to the 16th and 17th century. Center of the old town is the market square with the 16th century Church of Our Saviour and the town hall. From there you reach the residence of the Princes of Lippe-Detmold. The moated castle from 1548 is now home to the music college. In the year 9 AD three Roman legions suffered a crushing defeat against a Germanic army under the leadership of Arminius (Hermann). The for Rome traumatic event was of world historical importance as it marks the end of the Roman expansion. With the strengthening nationalism in Germany in the 19th century, the Battle of the Teutoburg Forest was glorified into a symbol of German strength and willpower. In 1875 a colossal statue was inaugurated in the Grotenburg on the Teutberg. 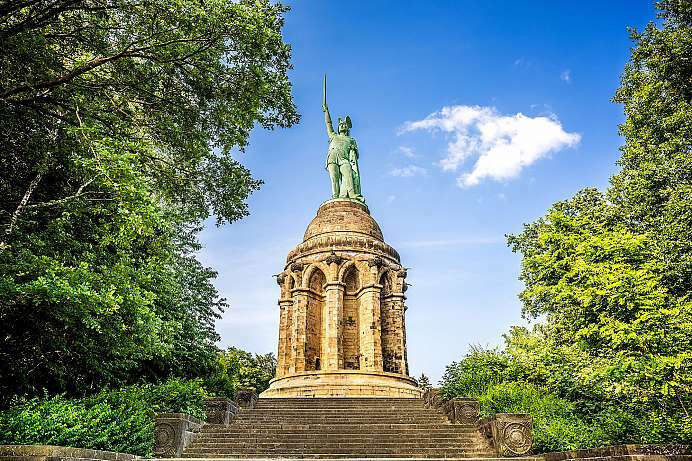 The 27 meter tall figure shows Arminius, victoriously stretching his sword. The statue was said to be a model for the Statue of Liberty in New York, which is ten years younger. The museum at the Königsberg is – with over 220 acres of land – the largest of its kind in Germany. Among the more than one hundred historic buildings are a windmill and two watermills. Old crafts such as spinning, weaving or forging are on display and old breeds of domestic animals are kept, such as the Lippe goose or the Bentheimer sheep.